Paralyzed athletes may not feel pain if they’ve received a serious blow or broken a bone during competition, but a new color-changing suit developed by students at the Imperial College London can show them where they’ve been hit. Bruise is an athletic, breathable suit that is outfitted with strips of pressure-sensitive film that turn red after a major hit. This way the athletes, coaches and trainers can all see where injuries might have occurred and ensure medial attention is received. Athletes push themselves as hard as they can in order to win, but injuries and pain can stop them in their tracks. But what if you can’t feel pain, or even know that you might have broken a bone? Paralyzed athletes push themselves just as hard during competition, but they might not know if they are injured and keep playing anyways because they cant feel it. Paralympic alpine skier, Talan Skeels-Piggins, deals with this problem in skiing as well as his other sports and activities, and an undiagnosed injury can set him back months. Inspired this serious problem paralyzed athletes face, a team of students from the Imperial College London worked to develop clothing that would alert them to injury locations and intensity of the blows. Team Bruise, made up of Lucy Jung, Elena Dieckmann, Dan Garrett and Ming Kong, discovered pressure-sensitive film, which permanently changes color from heavy pressure or impacts. Rather than making an entire suit from the film, the team created a pair of trousers made from breathable lycra with pockets where the pressure-sensitive film is inserted. During play or competition if the athlete is hit hard enough, the film will change to a bright red color and they can recognize potentially serious injuries. The darker the shade, the harder the hit and may mean they need medical assistance. Afterwards, the strips are fully recyclable and can be replaced with new ones for the next game. Team Bruise hopes to make entire suits out of the material to help those playing in a wider range of sports and they could even be useful for athletes who aren’t paralyzed. Paralyzed athletes may not feel pain if they've received a serious blow or broken a bone during competition, but a new color-changing suit developed by students at the Imperial College London can show them where they've been hit. 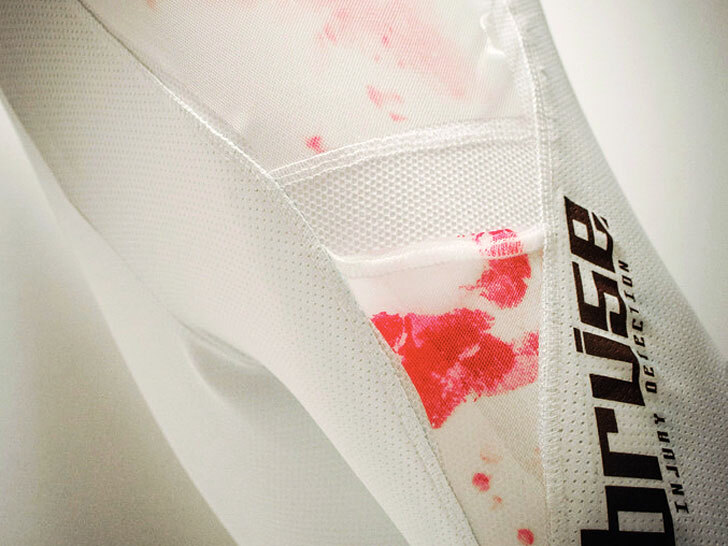 Bruise is an athletic, breathable suit that is outfitted with strips of pressure-sensitive film that turn red after a major hit. This way the athletes, coaches and trainers can all see where injuries might have occurred and ensure medial attention is received.